We are delighted that you are now the owner of a new Sizzll sausage pan. We hope that you have many years of easy cooking and washing up so that you can enjoy the great taste of sausages to their full! Place up to 8 sausages in the trough areas of the Sizzll pan and then place the pan under the grill. The Sizzll pan can either be placed on the grill pan supplied with your oven or directly on the metal oven shelf racks. For standard sized oven grills two Sizzll pans can normally be placed side by side on the metal racks, allowing 16 sausages to be cooked. Ensure that the sausages are not too close to the radiant grill above. Lower the pan and / or the heat if excessive fat is spitting on to the heater element. It can help sometimes to prick sausages to reduce spitting. Once the first sides of the sausages are cooked turn around by one-third and then again to complete. For grease drained, oven cooked sausages, simply place up to 8 sausages in the trough areas and load the Sizzll pan into the oven. Turn over half way if necessary. Defrosted sausages will sometimes be a bit wet and slippery. To stop them sliding about simply dry them off by cooking them for a short while in the outer area of the Sizzll pan. Then place them in the correct trough areas and cook as described above. Use oven gloves when removing the Sizzll pan from the oven / grill when hot. We do not accept liability for damage or injury caused as a result of improper use. 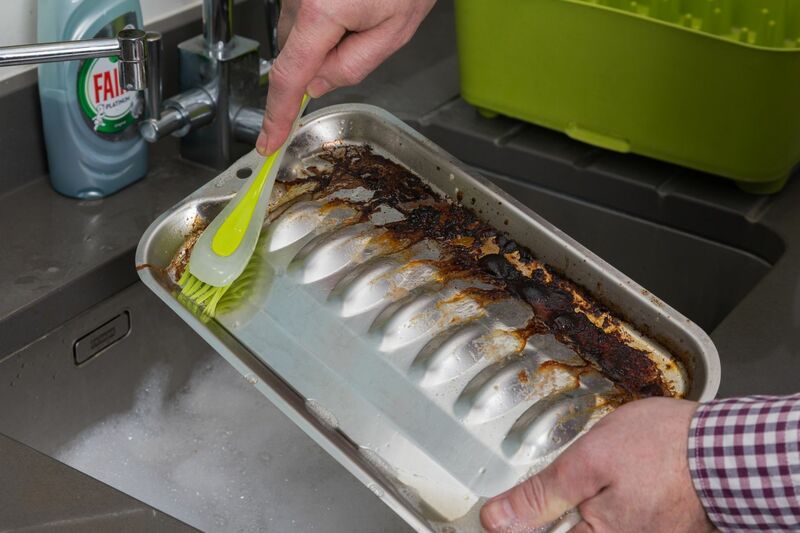 Clean the Sizzll pan well before first use using hot, soapy water. Drain / wipe away the bulk of the fat. Soak in hot, soapy water for 5 minutes and then wash using a brush or scourer. Place in a dishwasher to finish if required. Use a dishwasher or proprietary cleaner, such as Hob Brite, to clean any staining to the surface.